When you are putting together an outfit, you take time to choose your accessories; your shoes, jewelry and handbag. But what about the invisible accessory that cannot be seen – the whiff that follows you around? So how can you match your perfume with your outfit? Each perfume is unique and has its own character and style, so take this into consideration when you are choosing what scent to wear. There are so many wonderful fragrances to choose from. For example, if you are going for a tough rock and roll look with a concert t-shirt, skinny jeans, a leather jacket and thick voluminous hair – a soft and feminine floral scent will seem out of place. If you are wearing a pretty blouse, shorts and sandals on a summer day, a heavy and opulent winter perfume will also not fit with your look. The time of year and the weather outside will have an impact on what kind of clothing you wear, so it should also influence your fragrance choice. In the summer, you will likely be wearing lightweight clothing in bright and vibrant colors, such as pastel sundresses and shorts and t-shirts in juicy tones. To match this, wear light and subtle perfumes that have a fruity or floral fragrance – perhaps something with citrus notes. During the autumn, you will probably start to wrap up warm in cable knit sweaters, cardigans, leggings, boots and other adorable cozy clothing in rich and bold colors. With these outfits, you can wear a heavier and muskier perfume, perhaps one with undertones of wood, earth and berries. During the winter, your style will be drawn toward darker colors and you will be wearing more black, jewel tones and earth tones – such as a beautiful navy blue trench coat or a dark red scarf. The perfect fragrance to complement your winter look is a heavy and strong perfume or something unforgettable and classic such as Chanel No. 5. Another thing to consider when pairing fragrances with your style is the overall feeling that your outfit conveys. For example, if you are wearing a cozy outfit with a scarf and a cardigan for a preppy-chic look, you will want to choose a perfume that has hints of leather and bergamot – evoking the atmosphere of an old bookstore. If you are wearing a bright and colorful summer outfit such as a dress in tones such as yellow, orange and pink, the perfect scent to match the feeling of the outfit would be a light and fresh citrus-based scent. On the days that you are just keeping it simple and wearing a t-shirt and jeans, a great basic fragrance can be any perfume that is described as “fresh” and contains flowers or rosewood. You will smell clean and beautiful, without feeling too dressed up. 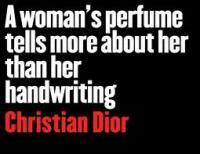 Pairing perfume to your clothing is quite subjective, because it really depends on your interpretation of the scent. There is no right answer, but your best bet is to inhale the perfume while keeping your eyes closed and letting your imagination reveal what images you picture. This is an interesting exercise and the images that come to mind will give you a hint of what outfit you should pair it with and what context you should wear it in. When you inhale a certain perfume, you might think of sensuality and seduction – which means that you might want to wear it on a glamorous date along with your little black dress. Another perfume might smell fresh and clean and sophisticated, so you might picture yourself wearing it to the office. Each perfume gives off a feeling and an impression – so listen closely to what your perfumes are telling you so that you can pair them up with the right outfit. Hope these tips will be useful to you... Have Fun Mxing and Matchng your Fahion and Fragrance!! !